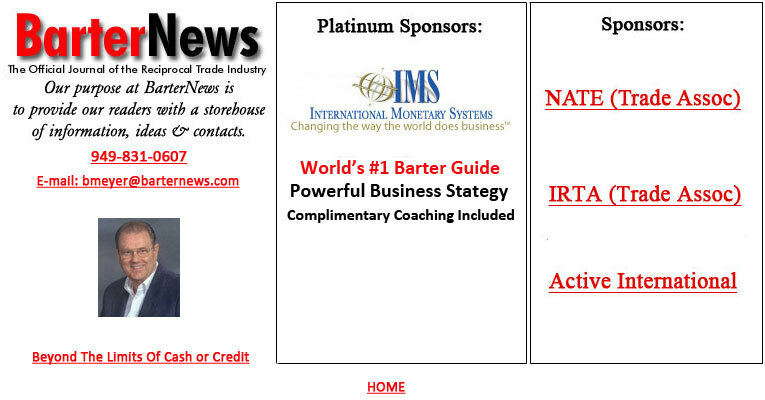 Articles in this section focus on the events and stories that relate to corporate barter, specifically larger companies that trade their products/services primarily through corporate barter companies, but also through barter brokers as well as doing direct trading. Corporate barter for the most part deals and focuses on "big business," companies with gross sales in excess of $10 million per annum. Larger companies, primarily manufacturers, will trade their excess inventory, rather than continuing to sell through usual distribution channels wherein they employ over-zealous discounting; scraping or junking and writing off the inventory completely; going outside normal markets, like selling to the third world export markets; selling to recyclers or going the auction route; employing commissioned brokers or consigning the inventory; donating the inventory to a charitable institution; or selling inventories to liquidators for pennies on the dollar and taking a substantial write-down. Through barter the manufacturers move their inventory to a corporate barter company (title changes hands) for trade credits, usually at wholesale or book value. Then the manufacturer spends the trade credits, with the assistance of the barter company, on a part cash/trade credit basis to make selected needed purchases. The technique is known as AR (accounts receivable) trading. To a lesser extent, barter brokers will assist companies by brining two parties together and collecting a cash fee for doing so. However, sometimes the fee is paid in "like-kind" inventory in lieu of cash, which enables the broker to build a "bank" of inventory. Kudos To Wal-Mart � World�s Largest Environmentalist! What Keeps Financial Executives Up At Night? Just 30 miles northeast of New York City is the headquarters of the world's largest corporate trading companyActive International. Location is a considerable factor in any business site determination, and Active's locale in Pearl River, New York, has it all. They're near the busiest center of commerce, yet embrace all that suburbia has to offer...quality of life, lower business operating costs, and affordable housing. But as beautiful as the bucolic area was when I visited them in late March, even more impressive were their operations, located on four floors (112,000 square feet) in the Blue Hill Office Complex. Years ago, back in October 1989, I'd met Active's co-founders Alan Elkin and Arthur Wagner in the Pocono Mountains at the International Reciprocal Trade Association's (IRTA) 10th Annual Convention. They were attending the first-ever, face-to-face meeting between various corporate barter company executives. Elkin and Wagner were two of the most enthusiastic supporters for the establishment of a permanent corporate barter trade organization, soon to be known as the Corporate Trade Council. Early on at that convention I first heard their vociferous laments, and concern, regarding the industry's stigma in the marketplacea laxness toward "retiring trade credits." They contended that when a client exchanged merchandise for trade credits, the client should be able to easily spend them. Wagner, in fact, says he entered the barter business, "because I knew I could retire trade credits, and I knew none of the other corporate barter companies focused much on that aspect." Elkin reinforced that belief by assuring him, "Artie, if we can do this, we'll have clientsnot barter deals. We can build a business, rather than making a score." Admittedly, in the beginning, like every other company that opens its doors without a lot of upfront capital, their immediate goal was to survive. Wagner recalled, "In the early days I did all the selling, while Al's responsibility was to grow the company from the inside. And, being the visionary he is, to take us into new areas so we'd have a good product to deliver." "If we can do this, we'll have clientsnot barter deals. We can build a business, rather than making a score." Elkin emphasized they always believed the key to ultimate success would be their ability to reduce a client's trade credits. "Our business is simple. In return for a company's products or services we issue trade credits; by doing so we help structure their balance sheet. "We then retire the trade credits for the client within the contract time frame. At the end of the day, you either retire trade credits or you don't. And if you don't you won't have repeat business." Today, 17 years later, they confirm it's been their client-centric focus, in conjunction with an enormously talented and hard-working staff, that has formed the foundation on which Active has built their enormous success. Last year Active International retired $110 million trade credits. They confirm it's been their client-centric focus, in conjunction with an enormously talented and hardworking staff, that has formed the foundation on which Active has built their enormous success. Prior to founding Active in January 1984, the cofounders, now both 61, had already been friends for over a decadeever since Elkin's wife Bonnie introduced them. They both had extensive experience in the media business too, which is the backbone of corporate barter. Elkin had been Senior V.P. and Director of Sales for Media General Broadcasting Services. He also served as VP and General Manager of Seltel, and VP and National Sales Manager at Katz Communications. They both had extensive experience in the media business too, which is the backbone of corporate barter. Wagner had served, as well, in senior sales and management positions with four broadcast companies...Seltel, Katz Communications, Field Communications, and Kaiser Broadcasting. So the friends made a big bet on themselves and decided to quit their secure corporate jobs with the expense accounts, company cars, and country club memberships to take on the risk of going into business together. Wagner, the consummate sales pro, added, "I didn't know anything other than I had made plenty of money for everyone I'd ever worked for. So I figured if I could do it for them, why couldn't I do it for myself?" Long-lived partnerships are a rarity. Yet this one has not only endured, it has flourished. Elkin says they're like a married couple. "It's not an easy thing, let me tell you that!" "And it's not that we don't have our disagreements. But here's the thing: we have the same belief system and the same core values. When you have similar standards, then all the rest is just small stuff. Plus, we trust each other implicitly." Wagner concurred, "It takes two to tango. Yet we're really very different in some areas, and don't see things from the same perspective. In fact, I've always kidded Al that we make one great person!" "And," he continued, "I wouldn't be as successful a man today if Al wasn't my partner. I can tell you that. He's brought so much into my life, and conversely, I'm sure I've contributed to his." Mr. Inside and Mr. Outside are dissimilar. I already knew of Wagner's passion for golf, and found out that recently he and Ellen have purchased a spectacular home in Boca Raton on a lush, private golf course. But I didn't learn of Elkin's passion for a unique form of recreation until after the long day's visit when Alan, myself, and COO Fredrick Fuest enjoyed some cocktails at the elegant Pearl River Hiltonright across the street from their office complex. There, in the French chateau designed full-service hotel, Elkin shared how he and Bonnie have enjoyed some remarkable adventuresincluding a visit to the South Pole on a working ship with only three other couples plus the crew. They've traversed the Amazon, taken African safaris, roughed it when visiting Viet Nam, and are soon to embark on a trip to the Himalayas where they'll trek the first few miles of the trail up to Mount Everest! While they may see things from differing perspectives, the one thing they both always agreed upon was that they went into business to create a successful venture. Which, succinctly, meant putting the company's business goals in front of their personal ambitions. The one thing they both always agreed upon was that they went into business to create a successful venture. To find out more about Active's breathtaking growth and remarkable accomplishments, we sat down with cofounders Alan Elkin and Art Wagner. Afterwards, due to the company's size, we met with other top management. Their valuable insights are found in the side stories throughout this most interesting look at the world's largest corporate trading company. BarterNews: You two have done an incredible job. What was the key to your outstanding success? Wagner: We didn't go into this business in a wishy-washy way. From day one, Al and I were very determined to succeed. It was more passion than rationality! Of course, in 1984 it didn't require much capital to get into this business, like it would today. BarterNews: What did it take? Elkin: The courage to open our doors and a conviction to perform, because the major question back then was, "Why don't other corporate barter companies retire trade credits?" We believed that we could build a very large company by focusing on that aspect of the business. And we're both type-A personalities, so once we got into the ring we wanted to be a winner. We believed that we could build a very large company by focusing on the business aspect of retiring trade credits. Wagner: That's really what happenedwe focused on delivering what we promised. And as we grew in capability we continually re-invested in our business. Elkin: The basic core beliefs of any strong business plan don't change, although they may evolve into other areas as a company grows. Initially we were a barter company, today we're a trading company with many different product lines. And having reached critical mass, Active is now on a higher plateau. BarterNews: What do you mean by critical mass? people, an extensive client base with predictable spending patterns, a variety of products, and a recognition in the marketplacelast year we placed $585 million in media and over $100 million in business services. As we grew in capability we continually reinvested in our business. For example, in regards to media, we're no longer trying to prove that we're a barter company, and "yes we can do media, too." We've moved beyond that. We're now recognized in the media community as a major force, as capable as anyone in that business today. Recently, as the economy has turned down, major TV networks and radio stations have called to see how Active can help them. So we've hit the radar screen in a big way. We're now recognized in the media community as a major force, as capable as anyone in that business today. Elkin: Bob, in terms of media, the LNA (Leading National Advertisers) ranks us #34 in the placement of print in the U.S. (Active Media is the 34th largest volume buyer of magazine advertisingnumber of pages.) And in some areas, such as fashion, we rank #2 in the country. showclient by clienthow many pages we've placed in each and every magazine. Active International is the first and only barter company ever to be accepted into the 4A (American Association of Advertising Agencies). BarterNews: You mentioned having a stable of loyal clients. What was your first breakthrough? Elkin: No question, a major breakthrough was getting the nation's 2nd largest wineryCanandaigua Winery in upstate New Yorkas a client. Today, twelve years later, they are still an account of ours. Wagner: Taking good care of Canandaigua consequently opened up the wine and spirits industry for us. Also, Murray of Ohio, a large bicycle company was a very large client for us back then. It added to our profile, plus provided some much-needed capital. Today, twelve years later, Canandaigua Winery is still an account of ours. And the media then took note, because we became a bigger buyer. It's important to be recognizable to the guy you're buying from. Since these initial deals built up our ability to spend, the media took us more seriously...which was a step toward where we are today. BarterNews: What part has technology played in your growth and development? Wagner: Oh my, the internal infrastructure, the computerization...wow! You know businesses don't run themselvesyou either grow or go. Now that we're now all over the globe, we've got this cost and that cost, traded this and spiral traded that. Without today's technology, who could keep track of it all? Everything has changed. Years ago we did accounts and bookkeeping manually, three or four months later we'd find out what the results were. Today I can determine what January's final results are by February 5th, or what the coming month's estimates are on the 1st, 7th and 14th. I need real-time information so I can make real-time decisions. Without technology none of this would be possible. managers are, or the location of our international offices, we're all on the same page. To facilitate communication we use video conferencing, our internet site is today's brochure, we show our products via digital video on our intranet around the world, and all our salespeople make professional, powerful presentations using their laptops. any time to the processincluding the client. Of course nothing will ever replace going out and holding a client's hand, letting them look into your eyeball. But, yes, there's no question a major investment in technology played its role in the building of the company. increase our business? I don't know if there's an answer yet. and be able to have a personal relationship. They want to buy from a human being. Buying habits are hard to change, and I don't think it's going to occur as quickly as people initially thought. Active's legal department drafts over 500 barter contracts a year between clients and vendors. BarterNews: Is the corporate barter business always going to be driven by media? Elkin: I think we are about to change that. Active's business services are quite effective, and in the future one will have to treat this business as a portfolio. One segment may have a lower margin than another, but at the end of the day it'll average out. Will the margins ever be as high as media? Probably not. But if business services, which include travel and printing, enable us to accelerate trade credit retirement, then it becomes very relevant. We've moved aggressively into printing and have a full printing service department of 25, from production managers to client service co-coordinators. BarterNews: So that's the reasoning behind your substantial printing efforts? Elkin: Exactly. We're moving into new products, like printing, because it enables us to do more business with our existing clients. After all we're a facilitator, offering services to our clients. Because our business is driven from the back end, two-thirds of our 300 people here in Pearl River are involved in this service effort. But if we can only provide media, then we are limited, and, if you will, restricted by our clients' media appetites. So we're creating new, additional ways for them to spend trade credits, which will grow our business. We've moved aggressively into printing and have a full printing service department of 25, from production managers to client service CO-coordinators, working with 350 pre-qualified printers. On average we're producing 250 printing projects a week. On average we're producing 250 printing projects a week, everything from creative design and pre-press to sheet fed and web printing. This includes books, magazines, and promotional materials down to hang tags, product labels, mailers, and inserts. Wagner: Another new direction is sports marketing, a $9 billion market that is continually in flux as sponsors come and go. We're moving into various sport venues including football, baseball, basketball, and auto racing. Another new direction Active has taken is sports marketing. Race cars are nothing more than moving billboards. And the driver is a walking, talking advertisement. Racing teams, of necessity, require funds to operate. We can offset some of their needs...hotels, transportation, some advertising, etc. This enables us to get in the middle of buying a sponsorship, which we can then provide to our clients for their inventory. BarterNews: How does your showroom in Pearl River come into play? Elkin: As you know, the sale of barter inventory is conceptual in nature. New prospects have found it, at times, quite theoretical...until they see our new sales room. That's where we showcase a number of our major clients, companies with worldwide status. About half of our clients have visited our Pearl River facilities, and we encourage prospects to visit as well. Last year we made the decision to put in a showroom so we could visually and graphically tell our story. There's no better way than to display the products we acquire, and resell. It shows everyone, in a very hands-on way, how we operate. And there is no better way to do that, than to have them not only hear our story, but to touch and feel the merchandise as well. Last year we made the decision to put in a showroom so we could visually and graphically tell our story. BarterNews: What was the impetus behind your new corporate barter loyalty program? within corporations have their own agendas, or don't want to interfere with their existing purchasing relationships...whatever. As a result, we've introduced a corporate barter loyalty program called ActivePoints that's similar to frequent flyer programs, in that our clients are awarded a point for every trade credit they spend. We've introduced a corporate barter loyalty program called ActivePoints that's similar to frequent flyer programs. It was designed as an additional incentive for our clients' utilization of trade credits, because we know when they spend them we get repeat business. sell, and close them. Now let's encourage them to spend down those credits, so we can do more business. ActivePoints gives clients another reason to trade. An officer of the client company designates the person responsible for redeeming the points. They can browse our site and spend at any time. BarterNews: What spurred your decision to expand globally? up our international effort eight years ago. We now have locations in London, Brussels, Toronto, Paris, Tokyo, Dusseldorf, Melbourne, Sydney, Budapest, Hong Kong, Mexico City, Madrid, Sao Paulo, Poland, and Seoul. We have 125 people employed in foreign countries and those offices have full access to all our inventoriesmedia and non-media. employed in foreign countries and those offices have full access to all our inventoriesmedia and non-media. But more importantly, what we want to do is be able to issue a trade credit anywhere in the world for under-performing assets, and then be able to sell anywhere in the world and retire the trade credits anywhere globally. BarterNews: Three years ago Active decided to move forward with an ESOP (Employee Stock Option Plan). Why did you take this route, selling part of what you started to your employees? positive, energizing environment so they look forward to returning the next morning. We certainly are aware that our product, ultimately, is our human capital. Secondly, the two of us wanted to leave a legacya well-built company that will continue when we're no longer involved on a day-by-day basis. The succession of younger people to help manage the business and bring it to another level has to happen, and our ESOP was a logical move. Wagner: We've brought in people who were smart and who came from a big company mentality. They've helped the company make the transition from a purely entrepreneurial one, to what we like to believe is a larger corporation with the spirit of an entrepreneur. We strongly believe that this task took Active to another level. Elkin: And that's hard to do, it's been a bouncy road getting it done. We've been on this track three years, and we're still not finished. But it's made a difference with the employees. They're striving harder to achieve their goals, which drives the growth of the company and improves the bottom line. And by having outsiders looking at the management of the company (an outside ESOP trustee looks out for the employees' interests), it takes us a step closer to functioning like a public company. The goals we've set at Active are very aggressive. company and keep it growing like it has the first seventeen years. BarterNews: Do you have one last comment? Wagner: We're not the best because we're the biggest. It didn't work that way. We became the biggest, because we're the best. We didn't do anything ingenious, really, we just worked hard. We didn't do anything ingenious, really, we just worked hard. For more information contact Active International at One Blue Hill Plaza, Pearl River, New York 10965. Phone (845) 735-1700, fax (845) 735-1938, or www.ActiveInternational.com. Please Note: There are an additional five interviews in the Active cover story, which are not included here on our web page. Copyright 2012 BarterNews. All rights reserved. Republication or redistribution of BarterNews content, including by framing or similar means, is expressly prohibited without the prior written consent of BarterNews.